I first heard about Noodle Kingdom and its awesomeness from Food Rehab and couldn’t believe I lived so near to such foodie goodness. My friend Suz organised a nearby outing to roller derby in Reservoir and so I suggested that we all go out to dine there beforehand. Who would have thought you could avoid the city and still have a night of good entertainment! Hurrah! 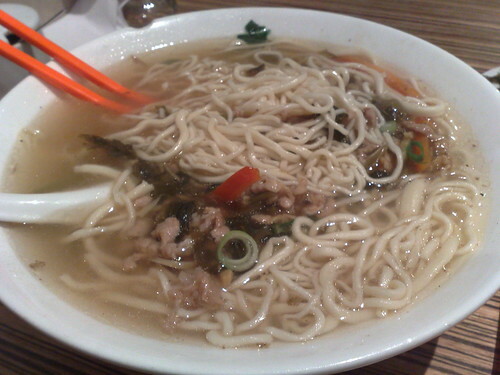 Further research indicated that newspapery foodie types thought that Noodle Kingdom wasn’t too bad either. My excitement grew. We dined at a ridiculously early hour (as in 5pm) knowing that we’d have to line up for good seats for roller derby and still the place was fast and furious. Tristan and I were there early and decided to share some steamed pork dumplings. Do not be fooled by how plain they look – they are seriously delicious. 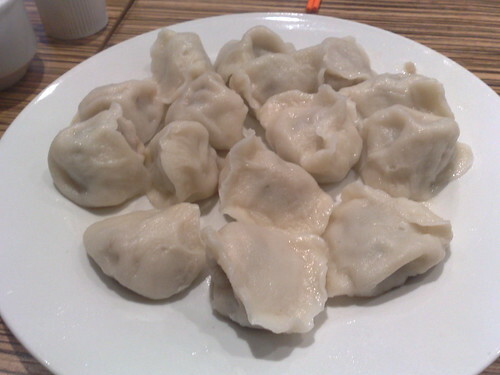 These dumplings have fairly thick skins and the meat is tasty and has lots of chives. Incidentally, Lindsey who arrived later, was not a fan of the thick skins. I personally love them, but thought you might like to know that not all foodies do. A little more research indicated that thick dumpling skins are apparently Northern Chinese in style (feel free to rap my knuckles with a ruler if I’ve got that wrong). When all our party arrived, most of us went the massive, cheap noodle bowls and thus confusion reigned when they started to come out thus augmenting our dumb Westerner mentality. Yes, that includes me despite my ordering the authentic Lanzhou beef noodle soup. 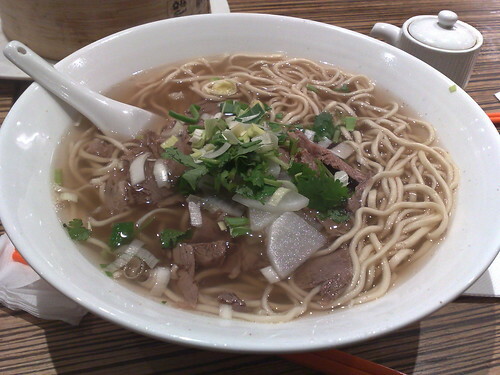 Hearty broth with thin noodles and a bloody generous serving of tender, sliced beef put me in a damn good mood. I mean, the noodles aren’t even $10 a bowl. This is a picture of Tristan’s order – before Lindsey errantly nicked his marinated egg – the beef brisket with hand pulled noodles. As you can see, the noodles are a lot thicker. This was an action shot stolen before we discovered that Lindsey was eating the wrong dish. Oops! Lindsey is not above telling people when they are being “bloody food bloggers” which is fair given he’s a consummate cookie-foodie. The Noodle Kingdom antics don’t end here. After a Melbourne Makers session way out of my hood, on the way home Tristan and I (as we both live out this way) slyly looked at each other and decided to revisit the noodle palace. And ordered way too much food, of course. None of which came out in the order expected. 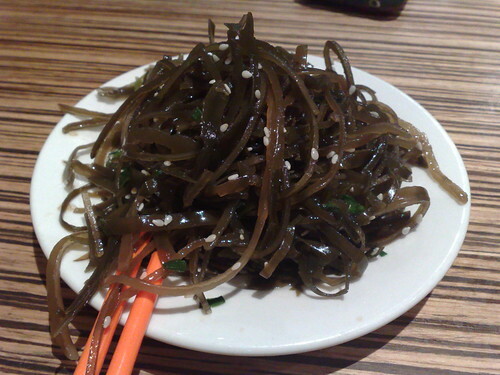 For instance, the cold seaweed which arrived last but I think of it as an appetiser. Not quite as tasty as Japanese seaweed salads, but still nice. 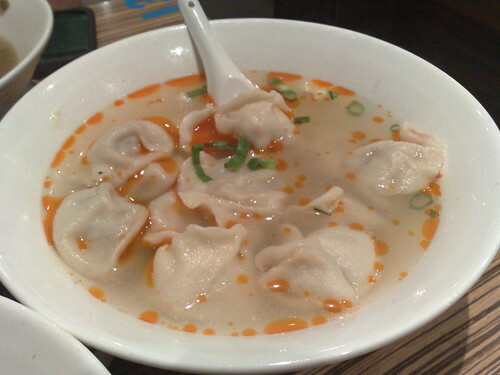 After both our noodle dishes arrived, dumplings with hot and spicy soup came. I dare say I could have done with more chilli oil which is unusual for me! Oh Noodle Kingdom, your dumplings have never disappointed me. Always tasty and fresh. 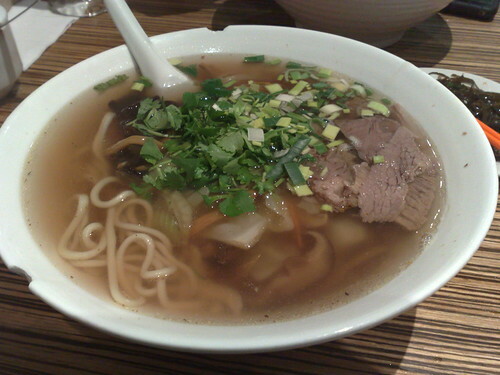 On this occasion, I ordered the combination beef noodles. I wasn’t quite sure what ‘combination’ meant in this instance, but it contained an assorted array of vegetables and also had coriander giving it a Vietnamese ‘feel’. There were these wrinkly seaweed leaves quite like nothing I’d ever had before that was just wonderful as they soaked up the broth really well. You can see them lurking in this photo – the dark things in the top left corner. They were also quite the textural treat. 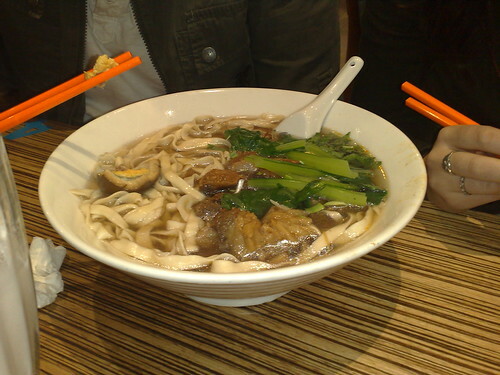 Tristan had the pork and preserved vegetable noodle bowl. I am in awe of the man’s eating prowess. He managed to help me with my dish, eat most of the dumplings and finish his own bowl of noodles. Then again, given how delicious the food is, it’s not hard. Not much else to add really: I think the fact that it’s warranted repeat visits should convince you it’s great. Don’t expect fancy dining but be sure to linger outside before entering to watch the masters make the noodles and dumpling skins from scratch. If you can’t venture out as far as Preston (though seriously, get over the suburb hate and give it a go! ), there’s another Noodle Kingdom located in the CBD on Russell St though my sources tell me it’s not as good as this one. I might like it more if they could be bothered replacing some of their severely chipped bowls ones, I don’t think that’s too much to ask…is it? This entry was posted in eatie-foodies dining out and tagged Chinese food, dumplings, Melbourne, Noodle Kingdom, noodles, Preston on June 28, 2010 by gem.